This article is about wheel angle. For the cross slope of road or railroad, see Cant (road/rail). 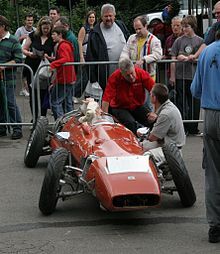 The 1960 Milliken MX1 Camber Car showing a large negative camber. Camber angle is the angle made by the wheels of a vehicle; specifically, it is the angle between the vertical axis of the wheels used for steering and the vertical axis of the vehicle when viewed from the front or rear. It is used in the design of steering and suspension. If the top of the wheel is farther out than the bottom (that is, away from the axle), it is called positive camber; if the bottom of the wheel is farther out than the top, it is called negative camber. Camber angle alters the handling qualities of a particular suspension design; in particular, negative camber improves grip when cornering. This is because it places the tire at a better angle to the road, transmitting the forces through the vertical plane of the tire rather than through a shear force across it. This effect is compensated for by applying negative camber, maximizing the contact patch area. Note that this is only true for the outside tire during the turn; the inside tire would benefit most from positive camber. Caster angle will compensate this to a degree, as the top of the outside tire will tilt slightly inward and the inner tire will respectively tilt outward. On the other hand, for maximum straight-line acceleration, the greatest traction will be attained when the camber angle is zero and the tread is flat on the road. Proper management of camber angle is a major factor in suspension design, and must incorporate not only idealized geometric models, but also real-life behavior of the components; flex, distortion, elasticity, etc. What was once an art has now become much more scientific with the use of computers, which can optimize all of the variables mathematically instead of relying on the designer's intuitive feel and experience. As a result, the handling of even low-priced automobiles has improved dramatically. In cars with double wishbone suspensions, camber angle may be fixed or adjustable, but in MacPherson strut suspensions, it is normally fixed. The elimination of an available camber adjustment may reduce maintenance requirements, but if the car is lowered by use of shortened springs, the camber angle will change. Excessive camber angle can lead to increased tire wear and impaired handling. Significant suspension modifications may correspondingly require that the upper control arm or strut mounting points be altered to allow for some inward or outward movement, relative to longitudinal centerline of the vehicle, for camber adjustment. Aftermarket plates with slots for strut mounts instead of just holes are available for most of the commonly modified models of cars. There are certain other aftermarket solutions that allow modifying camber angle of the wheels. Camber bolts with eccentrics allow adjustable camber on some vehicles. These bolts feature large washers that are either eccentric or offset. This turning will make insignificant change (up to 2 degrees) if the OE bolts are replaced with eccentric ones. Control arms (or A-arms) with adjustable ball joints is the other solution to allow side-by-side adjustability. With these control arms installed, tire camber can be effectively changed by simply moving the tires. Then, one tightens the bolts to lock the ball joint in such position. Adjustable length control rods is another aftermarket solution for camber angle change. Though, this is a solution for the vehicles, that employ control rods, not a-arms. Control rods locate suspension points and keep them in place, hence changing overall length of the rods influences the camber angle. 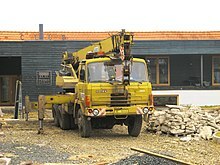 Many Tatra Trucks for terrain or mixed use had quite acute camber, clearly visible at some Tatra 138's and this Tatra 815 crane truck. Off-road vehicles such as agricultural tractors generally use positive camber. In such vehicles, the positive camber angle helps achieve a lower steering effort. Also, some single-engined general aviation aircraft that are primarily meant to operate from unimproved surfaces, such as bush planes and cropdusters, have their taildragger gear's main wheels equipped with positive-cambered main wheels to better handle the deflection of the landing gear, as the aircraft settles on rough, unpaved airstrips. ^ "Camber angle for racing cars: Explanation". Camber, Caster, Toe - What does it all mean?